Conducted by the American composer, conductor, author, music lecturer, and pianist Leonard Bernstein, the Wiener Philharmoniker (Vienna Philharmonic Orchestra) performs Wolfgang Amadeus Mozart’s Symphony No. 25 in G minor, K. 183/173dB. Mozart composed this symphony in October 1773, when he was just 17 year-old. Conducted by Leonard Bernstein, the Wiener Philharmoniker (Vienna Philharmonic Orchestra) performs Johannes Brahms’ Symphony No. 2 in D major, Op. 73. 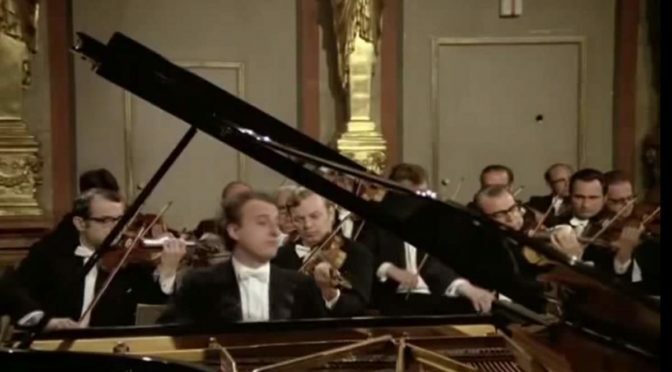 Accompanied by the Wiener Philharmoniker (Vienna Philharmonic Orchestra), Italian classical pianist Maurizio Pollini performs Wolfgang Amadeus Mozart’s Piano Concerto No. 23 in A major (K. 488). Conductor: Karl Böhm. Conducted by Leonard Bernstein, the Wiener Philharmoniker (Vienna Philharmonic Orchestra) performs Gustav Mahler’s Symphony No. 4 in G major. Soprano: Edith Mathis. 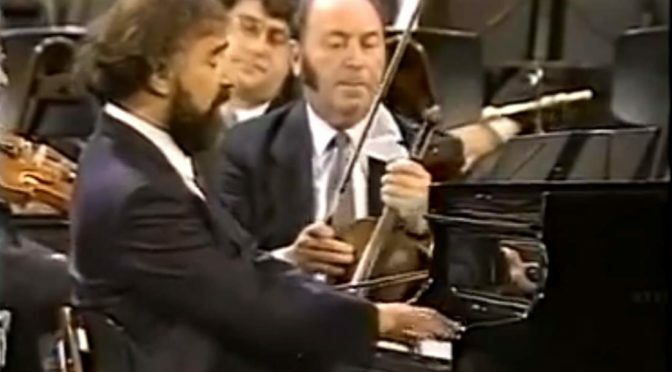 Accompanied by the Wiener Philhamoniker (Vienna Philharmonic Orchestra), Romanian concert pianist Radu Lupu performs Wolfgang Amadeus Mozart’s Piano Concerto No. 23 in A major (K. 488). Conductor: Sándor Végh. Conducted by Herbert von Karajan, the Wiener Philharmoniker (Vienna Philharmonic Orchestra) performs Pyotr Ilyich Tchaikovsky’s Symphony No. 4 in F minor, Op. 36.